On this day in 1961 Major Robert White piloted the X-15 on its first full-throttle flight, reaching a speed of 3,074 miles per hours at an altitude of 79,000 feet before climbing to a final altitude of 105,100 feet. 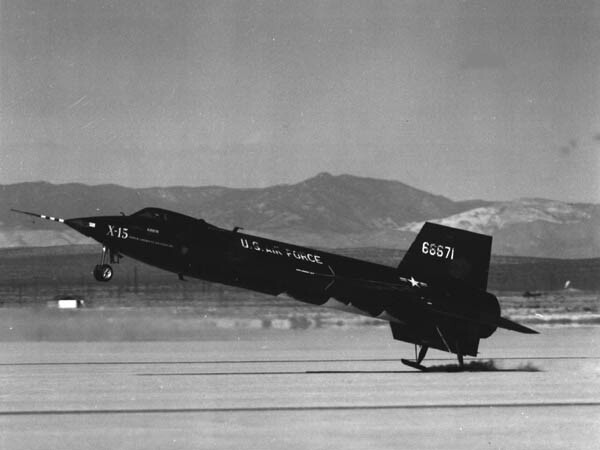 The X-15 was developed by North American Aviation as part of NASA’s x-plane series of experimental aircraft. During the X-15 program, 13 different flights by eight pilots met the criteria for spaceflight set by the USAF (reaching a 50 mile altitude), qualifying the pilots for astronaut status. The USAF pilots immediately qualified for astronaut wings, while the civilian pilots were awarded them in 2005, 35 years after the program’s final flight. The program’s sole USN pilot never took the aircraft about the requisite 50 mile altitude. The X-15 was carried aloft by a B-52 (named “Balls 8”) and dropped at an altitude of about 8.5 miles. Once dropped, the aircraft’s rocket engine would be ignited, giving about one minute of powered flight before returning to Edwards Air Force Base and making an un-powered landing on the base’s dry lake bed. The X-15 returned valuable data that was used in aircraft and spacecraft design and as of 2014 still holds the official world record for the highest speed reached by a powered, manned aircraft. This was achieved by Colonel William Knight when he reached 4,519 MPH on October 3, 1967.